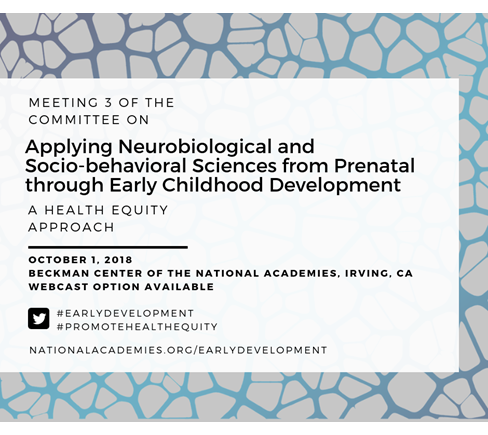 On October 1, 2018, the committee on Applying Neurobiological and Socio-behavioral Sciences from Prenatal through Early Childhood Development: A Health Equity Approach will host a short workshop at the Beckman Center of the National Academies in Irvine, California. The workshop will feature speaker presentations and discussions that address components of the committee’s statement of task. Registration is now open. The agenda will be posted shortly. This consensus study is part of the NAM’s Culture of Health Program. Don’t miss a thing! Join our mailing list for important updates.